A CubeSat is deployed April 27 from a deployer on the outside of Kibo lab module. 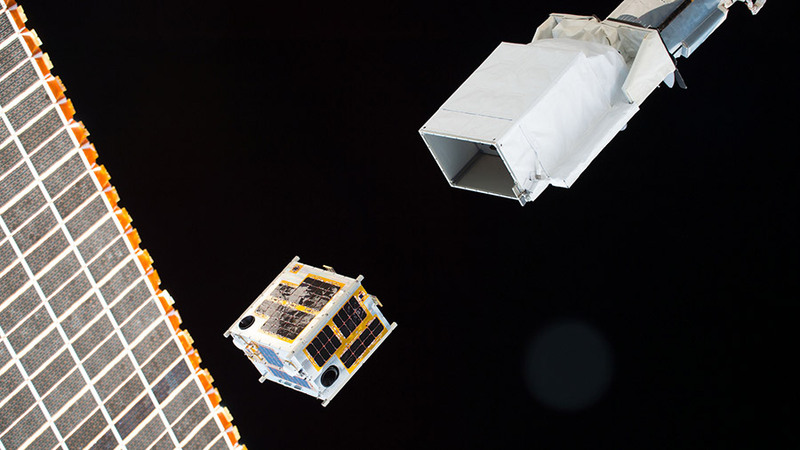 More CubeSats are due to be deployed today contributing to humanitarian and environmental research. The crew is also continuing biomedical science to improve the health of astronauts in space and humans on Earth. The final set of CubeSats will be released tonight from a small satellite deployer outside Japan’s Kibo laboratory module. This current fleet of 16 CubeSats, also known as Dove satellites, began deploying Monday and will monitor the Earth to help improve disaster relief and agriculture yields. The crew is exploring new space exercise techniques today to keep muscles, bones and the heart healthy during long-duration missions. The crew is also tracking its medication intake to determine the effectiveness and any side effects of using medicine in space. BEAM, or the Bigelow Expandable Activity Module, is still undergoing temperature and pressure checks while some relief valves and ventilation valves are being swapped out. Astronaut Jeff Williams will enter BEAM for the first time next week to install sensors measuring the expandable module’s environment.